When visiting Oakland with the family be sure to visit the Oakland Zoo. Who doesn't enjoy seeing exotic animals? The Oakland Zoo was founded i1922, by Henry Snow and the Zoo still remains in n the original location in Knowland Park since 1936. The Oakland Zoo is open daily and is home to more than 600 native and exotic animals. When visiting the Oakland Zoo visitors will have fun exploring the Zoo's many exhibits & learning about animals that live in different regions. Visitors of all ages will enjoy learning about the Elephant's, see where the River Otters come from and learn why Oakland Zoo's Bats love fruit... 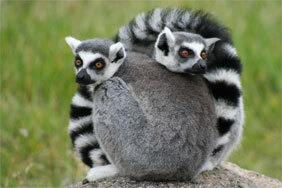 The Oakland Zoo features a four acre Children's Zoo & exhibit just for younger children. Here kids will discover a special zoo offering hands-on opportunities with the animals, there is a Children's Museum and a playground. The Wayne & Gladys Valley Children's Museum is designed to be a world of learning & discovering through encouraging children to learn through play and exploration. Daily the Zoo has animal feedings be sure to pick up a schedule when you enter the Zoo. Everyone will enjoy seeing the animals eat especially the Alligators..... After visiting the animal exhibits visitors will have fun when you ride on the CP Huntington miniature train, the Sky Ride which gives you a great overview of the Zoo especially the Bison exhibit which is located up on the hill and can really be viewed well from the lift. Along with other exhibits and a mini amusement area where kids can ride a variety of fun rides. Save money on your next car rental with Thrifty. Our customers are greeted by knowledgeable and friendly staff members who will have you on the road in no time... Save money today with Thrifty Discount Coupons . Thrifty has been a staple in the rental car community for many, many years. You can't beat a great deal from one of the most well known names in the business. During your visit to Oakland, California if you enjoy seeing beautiful, historic Estates you have to visit Dunsmuir Historic Estate and Gardens. This stunning Estate was designed by J. Eugene Freeman, a San Francisco architect and is a great display of Neoclassical-Revival architecture which was popular during the late 1800's. The Dunsmuir Estate features 16,224 square feet, 37 rooms, Tiffany-style dome, ten fireplaces, inlaid parquet floors, wood-paneled public rooms and servant quarters in the house that were large enough to accommodate 12 live-in staff members. 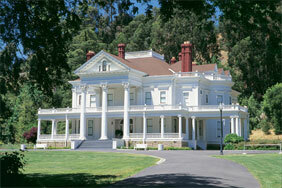 The Dunsmuir Mansion was built by Alexander Dunsmuir who moved to the Bay area in 1878. Alexander was the son of Robert Dunsmuir, a wealthy coral baron from Victoria, British Columbia. Over time Alexander oversaw the family business which was located in San Francisco. This large, elegant mansion was built as a wedding gift for his beloved Josephine in 1899. Alexander became very ill & died while they were in New York on their honeymoon. Josephine returned home to her new mansion where she lived until her death in 1901. The estate was purchased in 1906, by I.W. Hellman Jr. who worked for Well Fargo Bank in San Francisco. This became the summer house for Mr. Hellman & his family which they re-named to Oakvale Park and in 1913 the estate was re-modeled to accommodate the growing Hellman family along with their acquisitions from traveling through Europe. The Hellman family lived in the estate for fourteen years until Mr. Hellman passed away in 1920. Mrs. Hellman kept the estate and lived here, her children and grandchildren would visit during the summer months until the late 1950's. While the Hellman's lived in the estate they landscaped the northern end of the estate, added a swimming pool and a Carriage House. The Dunsmuir Estate House and Carriage House have been designated Historic Landmarks by the City of Oakland and the Dunsmuir House has been designated a National Historic Site by the United States Department of the Interior. The stunning gardens the Hellman's along with the famous landscape architect John McLaren (who designed the Golden Gate Park) together designed the Dunsmuir Gardens. The Gardens are full of a wide variety of trees, rolling meadows, seasonal blooming flowers and more. In addition to the Gardens the Hellman's estate also features a golf course, tennis court, glass conservatory with grotto, a large formal garden maze, an elaborate aviary, Japanese Gardens and a swimming pool with a Mission-style bathhouse. Guided tours are available for the Historic Dunsmuir Mansion and Gardens your knowledgeable guide will lead you on an adventure of the beautiful Estate grounds and the 37-room Dunsmuir mansion. High heeled shoes are NOT permitted in the Mansion so be sure to wear comfortable walking shoes.